When giving a gift or storing a precious object, it is always desirable to use an attractive box for presentation. Boxes lined with velvet are particularly lovely, and seem to enhance the importance of the object that is stored inside. Because of this, many pieces of fine jewelry are sold in velvet-lined boxes. While these boxes can be found in stores, they can also be made at home. You can line a box of any shape, size OR construction with velvet. You can make a homemade velvet-lined box quite easily and inexpensively. 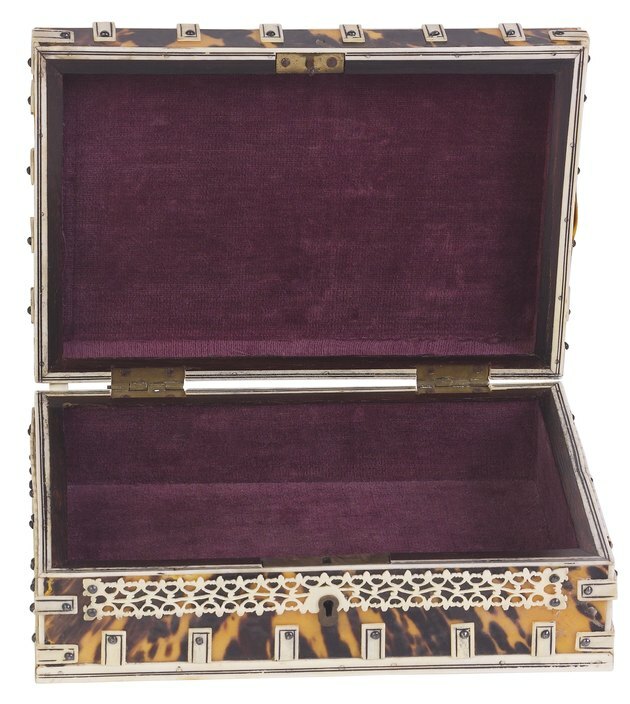 Boxes lined with velvet are ideal for presenting precious objects. Place the box the your work surface. Using the tape measure, measure the dimensions of each side of the inside of the box. Write down these measurements for easy reference. Place your poster board onto your work surface. Onto the poster board, measure and mark the dimensions that make up each side of the inside of the box. Place your poster board onto a surface that will not be damaged through cutting, such as a cutting mat. Lay a ruler next to one of the lines drawn in Step 2. Place your cutting knife at the end of the line, and cut along the line carefully, using your ruler as a guide. Repeat for the remaining lines, until your shapes can be removed from the poster board. Test the sizes of the shapes by placing them inside the box. If they fit, you can continue. If they are too large, remeasure and cut excess poster board away from the shapes. If they are too small, you will need to remeasure and cut additional shapes from leftover poster board. Add 2 inches to each of the measurements taken in Step 1 of "Creating the Backing." These 2 inches will allow extra room for folding of the velvet over the poster board shapes. Write the new dimensions on a piece of paper for reference. Measure and mark the shapes of the inside of the box onto the piece of velvet, following the dimensions written down in the previous step. Place your velvet onto a work surface that can safely withstand cutting, such as a cutting mat. Place a ruler against one of the lines drawn on the piece of velvet in Step 2. Using the ruler as a guide, cut along this line with your utility knife. Repeat this step to cut along all remaining lines, until your shapes can be removed from the piece of velvet. Lay each piece of cut velvet onto your work surface. Measure and mark a one-inch square on each corner of each shape. Cut these shapes from the fabric using scissors or a utility knife. Line your work surface with newspaper. Place one velvet shape onto the work surface, right side down. Place the correlating poster board piece on top of the shape, lining it up so that it is centered inside the fabric. Lift the poster board from the velvet, and spray the backside of the fabric with spray adhesive. Immediately, place the poster board back into place and press down firmly. Fold the excess edges of velvet around the poster board, and press the pieces against the board in order to attach them as firmly as possible. Since the fabric on the back will not be seen, it does not need to appear even or attached in all areas. Repeat Steps 1, 2 and 3 for the remaining pieces of velvet. Squirt several drops of craft glue onto the back of one of the lining pieces that make up a side of the box. Insert this piece into the box and press down firmly to secure it into place. Repeat this step for the remaining lining pieces, saving the bottom piece for last.